Selma Halik, holding her 2-year-old daughter Amara at a refugee camp on the Greek island of Lesbos, says much of her family was wiped out by ISIS. She doesn't want her daughter to see the things she's seen. In a camp just north of the port, Syrian Selma Halik holds Amara, her 2-year-old daughter, who flashes smiles and waves at visitors. Halik describes how they were forced to leave Kobani two years ago, after an onslaught by fighters from the Islamic State. "My family was almost wiped out," she says. "ISIS killed my brother, my aunt and my uncle. They caught them and just murdered them. We couldn't stay." Halik, her husband and daughter fled to Izmir, on the Turkish coast. Her husband got a job — low pay, under the table. While Amara clings to her and chatters away, Halik explains why it didn't last. 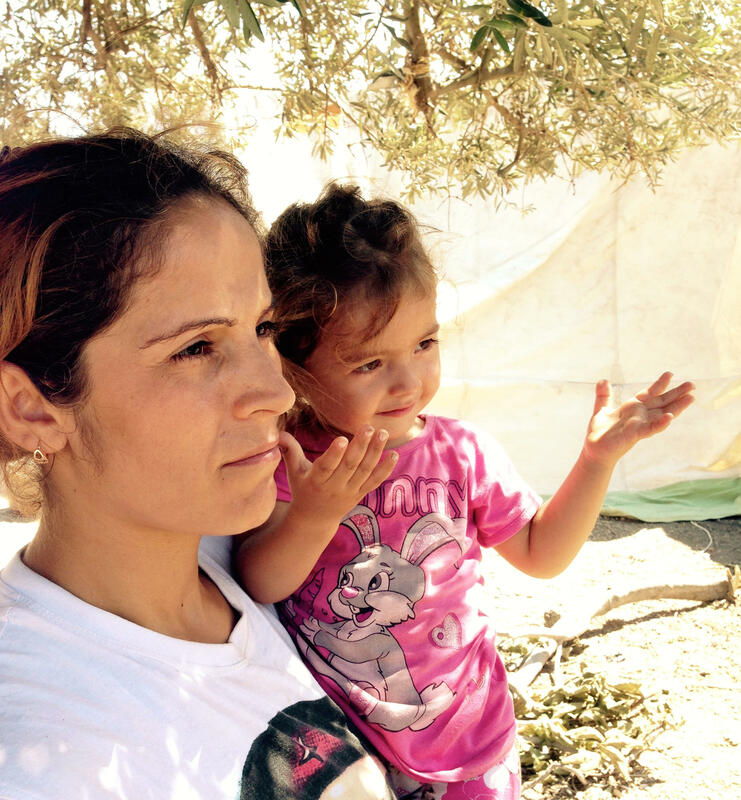 "There was a funeral in Kobani, we had to go, and so my husband lost his job," she says. "There wasn't any other work, so I sold my gold and we came here." Unlike some refugees, Halik doesn't have a preferred destination in Europe — just somewhere her daughter can grow up safely. "We'll go wherever our money can take us," she says. She and her husband are adults; they've seen it all, she says. "We don't know if our future will be bright or dark. But I don't want this little girl to have to see the kind of blood and slaughter we've seen." Down by the ferry waiting to take refugees to Athens, Mohammad Awiya, an outgoing Iraqi, seems happy to show off his English. He says he learned it while working with the U.S. military in Iraq. He arrived in Turkey two weeks ago and tried to find his way to Europe. "I spent one week in Istanbul and tried to smuggle into Bulgaria," he says. But he was turned back. "It's crazy, mate — soldiers there," he says. "They beat us, took our phones, took our money. I tried to talk to them. They never responded." Awiya's next attempt — by sea to Lesbos in a crowded, inflatable boat — was successful. "Yeah, yeah, it's rubber, and there are 29 guys and five kids," he says. "It was crazy, you know, because it's all full of water. And I had, like — the bottles, I just cut in half, and I took all the water inside and bailed it out." Awiya bought a ferry ticket costing nearly $70 to Athens, but he doesn't plan on staying long in Greece. "Hell no, no. I'm not staying to Athens, no," he says. "I'm going to somewhere like Sweden, Germany, something like that. Because I applied for the Americans for five years, they didn't do me nothing. Nothing." He says he spent those years pursuing one of the special visas Washington offered to some of the Iraqis who worked directly with the military, but was always told his application was "in process." "I have three shrapnel in my body, I have cuts, 12 stitches," he says. "I worked with 101st Airborne, 1st Division Marine Corps, 31st Task Force medic, 115 Task Force medic, and I apply since 2009. Nothing they do for me. Nothing." NPR hasn't independently confirmed that Awiya worked with the U.S. military. Like most of the people I met on the island, Awiya says neither staying here nor going back is an option. "Because I have family here with me. I have to make it," he says. Returning to Baghdad is out of the question. "No chance. No chance to come back," he says. So he moves forward. By now, Awiya, Halik and their families will be back on the migrant trail to Europe, unsure of what will happen next. NPR's Peter Kenyon's been speaking to Syrians and Iraqis making the trip from the coast of Turkey to Greece. And he sends us this postcard from the Greek island of Lesbos. PETER KENYON, BYLINE: This island has been transformed from a dream vacation spot to a haven of a different sort, free from the horrors of war in Syria and Iraq. From here, those that survived the crossing from Turkey can try to press further on into Central and Northern Europe. And the obstacles ahead don't seem nearly as difficult as the ones they left behind. But many are carrying the savage violence they escaped from in their memories. Their greatest hope is that their children will be spared what they went through. In a camp just north of the port, Syrian Selma Halik holds her 2-year-old daughter, Amara, who flashes happy smiles and waves at visitors as her mother describes how they were forced to leave Kobani two years ago after an onslaught by fighters from the Islamic State. SELMA HALIK: (Through intrepreter) My family was almost wiped out. ISIS killed my brother, my aunt and my uncle. They caught them and just murdered them. We couldn't stay. KENYON: Halik, her husband and daughter came to Izmir on the Turkish coast, and he got a job - low pay, under the table. As Amara clings to her mother and chatters away, Halik explains why it didn't last. HALIK: (Through interpreter) There was a funeral in Kobani. We had to go, and so my husband lost his job. There wasn't any other work, so I sold my gold and we came here. KENYON: Unlike some refugees, Halik doesn't have a preferred destination in Europe, just somewhere her daughter can grow up safely. HALIK: (Through interpreter) We'll go wherever our money can take us. We tell ourselves we're adults - we've seen it all. We don't know if our future will be bright or dark, but I don't want this little girl to have to see the kind of blood and slaughter we've seen. KENYON: Down by the ferry, we meet Mohammad Awiya, an outgoing Iraqi who seems happy to show off his English, which he says he learned while working with U.S. military in Iraq. He arrived in Turkey two weeks ago and tried to find his way to Europe. MOHAMMAD AWIYA: I spent one week in Istanbul and tried smuggling to Bulgaria. KENYON: What happened at the border? AWIYA: It's crazy, mate, soldiers there. They beat us, they take our phones, they take our money - I tried talk to them, they never responded. KENYON: His next attempt was by sea to Lesbos. KENYON: And bail it out? AWIYA: And bail it out. KENYON: Awiya bought a nearly $70 ferry ticket to Athens, but he doesn't plan on staying long. AWIYA: Hell, no. No, I'm not staying to Athens, no. I'll go somewhere like Sweden, Germany or something like that because I applied for five years with the Americans. They didn't do me nothing - nothing. KENYON: He says he spent five years pursuing one of the special visas Washington offered to some of the Iraqis who worked directly with the military, but was always told his application was in process. KENYON: NPR hasn't independently confirmed that Awiya worked with the U.S. military. Like most of the people we met on the island, Awiya says neither staying here nor going back is an option. AWIYA: Because I have family here with me, you know. I have to make it. KENYON: So going back to Baghdad is just not safe. AWIYA: No chance - no chance to come back. KENYON: By now, Awiya and Halik and their families will be back on the migrant trail to Europe, unsure what happens next. Peter Kenyon, NPR News, Lesbos, Greece. Transcript provided by NPR, Copyright NPR.